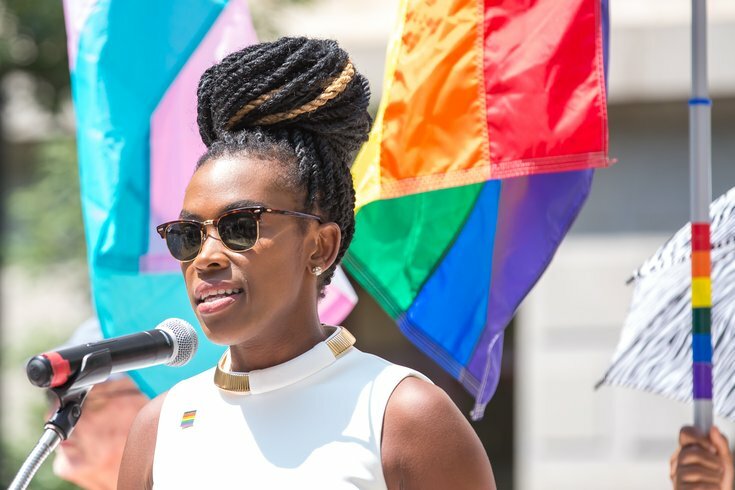 Amber Hikes, director of the Philadelphia Office of LGBT Affairs, made a plea for support of the LGBT community and reiterated the City of Philadelphia's continued commitment. When Dante Austin entered the Pennsylvania Army National Guard in 2009, he was forced to hide his sexual orientation due to the military's "Don't Ask, Don't Tell" policy. He couldn't attach a picture of his boyfriend to his locker like other Guard members did with photos of their girlfriends. He was even afraid to have his boyfriend's name appear in any letters. Austin came out as gay in 2015 – four years after "Don't Ask, Don't Tell" was repealed. While some service members maintained their respect, Austin said others did not hide their disdain. Based on his own experiences, Austin offers both sympathy – and respect – to the thousands of service members impacted by President Donald Trump's proposal to ban transgender people from all aspects of military service. Austin was among veterans who spoke Thursday at an afternoon rally to support transgender service members. Dozens of supporters gathered in the Philadelphia City Hall courtyard to honor their service, offer encouragement and pledge their efforts toward halting Trump's ban. "It's so admirable to see people who are publically open in the military," said Austin, whose service ended last year. "I know how hard it was for me, being gay. And being gay and being trans in this country are very different – it's a whole difficult kind of struggle. "We need to celebrate and uplift our trans service members. All the energy that was put into the repeal of "Don't Ask, Don't Tell," we need to put it into that ban, so that they can serve openly and freely." The rally came eight days after Trump tweeted his intention to bar transgender people from serving in the military, saying they burden the military with "tremendous medical costs and disruption." U.S. Army veteran Dr. Remolia Simpson, executive director of My Brother's House, a nonprofit dedicated to providing safe and supportive housing veterans of all branches of the U.S. military, spoke outside of City Hall, Thursday, August 3, 2017. 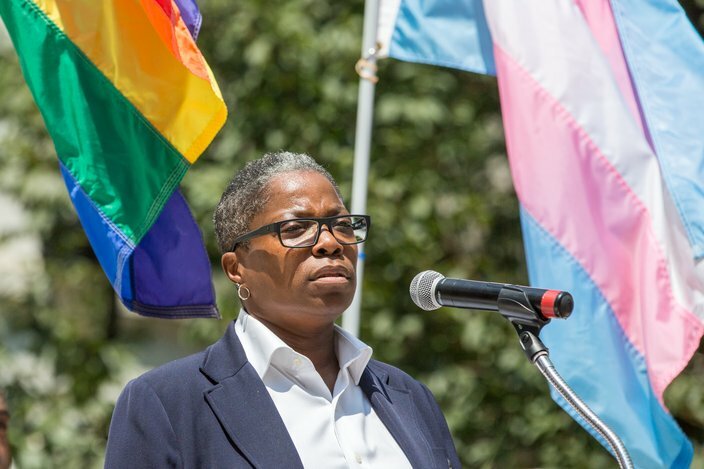 Sue Fulton, a board member at SPARTA, an organization comprising current and former LGBT service members, said transgender members serve at twice the rate of the general population. Many of them are concerned and alarmed by Trump's actions, but she said they are not afraid. "They have sworn to support and defend the Constitution of the United States against all enemies, foreign and domestic," Fulton said. "They have put their lives on the line to stay true to that mission. They defend our freedoms every single day. "They defend the freedoms of the people who hate them. They defend the freedoms of the people who would fire them. And they are courageously living their lives as their true selves with integrity. They are the bravest people I know." Fulton then introduced Army Capt. Evelyn Rhynedance, a transgender woman who said she is grateful to serve alongside "the best soldiers in the world." "We've been able to do some amazing things in some remarkable places," Rhynedance said. "We were able to do that because we all raised our hands and came together for a reason. And there are thousands of people, like me, who are going to keep raising our hands and doing those things." Her brief remarks brought a round of applause and chants of "thank you." 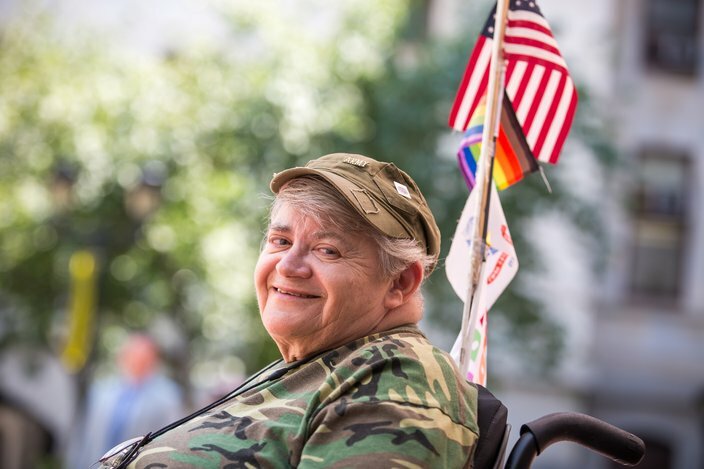 Veteran Denise Samen, who served in the U.S. Army during the Vietnam War, attended the rally on Thursday to show her support for veterans and the LGBT community. A 2016 study, commissioned by the Department of Defense, estimated that 1,320 to 6,630 transgender people serve in the military. It found their service would have minimal impact on the military's readiness and health care costs. Trump's proposed ban would reverse a policy adopted last year by the Obama administration that permits transgender individuals to openly serve in the military. Since tweeting his intentions last week, Trump has not provided details on when his ban will take effect, how members will be identified or how they will be discharged. A group of 56 retired generals and admirals released a joint statement Tuesday saying the ban would disrupt and degrade military readiness. The Trump administration claims it would have the opposite effect. And Coast Guard Commandant Adm. Paul Zukunft said his branch will "not break faith" with its 13 openly transgender service members. That came as another group of retired military leaders released a letter supporting Trump's ban, saying it will help save the military's "culture and war-fighting capacity." Mayor Jim Kenney denounced the ban during the rally, calling it an "appalling step backward." "Though this news was both disgusting and disheartening, we in Philadelphia will not stand for government-sanctioned bigotry and blatant transphobia," Kenney said. "We will continue to fight back to ensure people of trans experience have every possible right and protection under our laws." Fifty-five percent of voters in military households support transgender people serving in the military, according to a Quinnipiac University poll released Thursday. Another 39 percent disagree. The same poll found 68 percent of American voters support transgender military personnel while 27 percent did not.